The Young Man of Chan Hol, named after the cenote it was found in, was recovered in a 542 meters long and 8.3 deep cave where stalagmites abound, and is reached after going through flooded, dark and difficult labyrinths. Photo: DMC INAH. M. MARAT. MEXICO CITY.- One of the earliest human skeletons of America, which belonged to a person that lived more than 10,000 years ago, in the Ice Age, was recovered by Mexican specialists from a flooded cave in Quintana Roo. The information it has lodged for centuries will reveal new data regarding the settlement of the Americas. The Young Man of Chan Hol, as the skeleton is known among the scientific community, due to the slight tooth wear it presents, which indicates an early age, is the fourth of our earliest ancestors found in the American Continent, and has been studied as part of a National Institute of Anthropology and History (INAH) project. After 3 years of studies conducted In Situ to prevent information loss, the Chan Hol skeleton was subtracted from the water by a team of specialists headed by biologist Arturo Gonzalez, coordinator of the project Study of Pre Ceramic Men of Yucatan Peninsula and director of Museo del Desierto de Coahuila (Museum of the Desert of Coahuila), with the participation of speleodivers Eugenio Acevez, Jeronimo Aviles and Luis Garcia, part of the recently founded Instituto de la Prehistoria de America (Institute for American Prehistory), funded by INAH. The Young Man of Chan Hol, named after the cenote it was found in, was recovered in a 542 meters long and 8.3 deep cave where stalagmites abound, and is reached after going through flooded, dark and difficult labyrinths. UNAM (National University of Mexico) physical anthropologists that studied the remains think they were placed in the cave after a funerary ceremony that took place by the end of Pleistocene, when the sea level was 150 meters lower, before the caves, probably walked by this person, got flooded. Sixty per cent of the skeleton was collected: representative bones of 4 extremities, vertebrae, ribs and the skull, as well as several teeth. Physical anthropologists find this great, since in cases of 10,000 years old samples usually only the skull or jawbone is found, and sometimes, 20 or 30 percent of the skeleton. Along with the skeletons of the Woman of Naharon, Woman of Las Palmas and Man of El Templo, discovered as well in flooded caves near Tulum, Quintana Roo in recent years, the Young Man of Chan Hol is a key factor to understand the settlement of the Americas, since its finding strengthens the hypothesis of the American Continent being populated by several migrations from Asia. Arturo Gonzalez, paleo biology specialist, mentioned that the 4 skeletons found in Quintana Roo flooded caves reveal that migrations from Southeast Asia happened earlier than Clovis groups ones, who would have crossed from Northern Asia through Bering Strait as well, by the end of the Ice Age. Our dating confirmed that skeletons collected in Quintana Roo caves belonged to members of Pre Clovis groups and are part of the few human rests found from the American Terminal Pleistocene, with physical features similar to those of people from Central and South Asia, suggesting there were several migrations to our continent. The first physical anthropology report, conducted by physical anthropologists Alejandro Terrazas and Martha Benavente, from the UNAM (National University of Mexico) Institute of Anthropological Investigations, indicates the skeleton belonged to a young adult, probably a male; legs were flexed to the left and arms extended to both sides of the body, which is a new fact to be studied, since no skeleton had been found before in this position. The skeleton of the Young Man of Chan Hol must stay as they are for several months until their consolidation, before undergoing morphoscopical studies (of the skull and bones) to verify if it shares morphological and physical features with the other 3 skeletons found in the caves; gender, age, cause of death and age at the time of death will be confirmed too. Carbon 14 Dating will be conducted as well as Computed Axial Tomography (CAT) studies to determine composition, density and interior form of the bones. In 2006, two German speleodivers named Thursten discovered the skeleton while exploring the Chan Hol (small hole in Maya) cave, aiming to lengthen the life line (guide placed by divers to avoid getting lost inside caves). They saw the osseous rests and informed the Quintana Roo INAH Center, which specialists began registration immediately. Taking the Joven de Chan Hol out of the water context was not easy. It took 3 years after the Thurstens found it to conduct In Situ archaeological and physical anthropology studies that finally allowed the extraction with minimum conservation risks. Studies include photographic and video registration of the remains and their context; more than 50 exploration immersions in the cave were conducted to study the possibilities of moving the skeleton, since each centimeter of the skeleton and its context represented an irreplaceable piece of the millenary history puzzle. 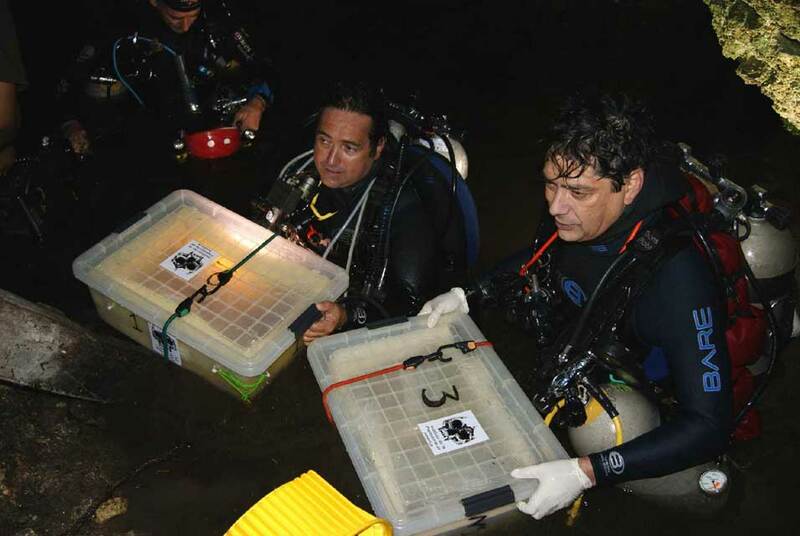 Investigations are being conducted by INAH, UNAM, Museum of the Desert of Coahuila and the Institute for American Prehistory in a project now inter-institutional- that originated 10 years ago in INAH: the Underwater Archaeological Atlas for the Register, Study and Protection of Cenotes in the Peninsula of Yucatan, headed by the pioneer of underwater archaeology in Mexico, Pilar Luna Erreguerena. Recovery of the fourth Ice Age skeleton was conducted by biologist Arturo Gonzalez, director of the project, with the collaboration of physical anthropologists Alejandro Terrazas and Martha Benavente, who gave indications from the surface to take the bones out without loosing important information for the reconstruction of their identity. Inside the cave, Arturo Gonzalez was accompanied by speleodivers Jeronimo Aviles, Eugenio Acevez and Luis Martinez. The four of them carried 80 kilograms of equipment, among oxygen tanks, lamps and snorkels, as well as waterproof cameras (a photographic camera and 2 camcorders), a tripod, lighting devises, and 3 plastic boxes with protection inside to carry the millenary human remains. Recollection was conducted in 2 days, with a total submersion time of 5 hours, during which the last registration took place. Bones were placed in plastic bags with water from the cave to avoid temperature and acidity changes, and after it, in previously numbered boxes, where the remains were brought to the surface. A stalagmite was collected with the bones, since it had fell on the left humerus of the skeleton; this is important for anthropologists because it allows assuming that the human rests were placed in the cave more than 10,000 years ago, since this mineral formations are not found in flooded caves. Arturo Gonzalez detailed that in the Ice Age the Peninsula of Yucatan must have been a desert pastureland that turned into rainforest due to climate change. Young Man of Chan Hol and his peers found refugee in the caves and drank rainwater that filtered to the most profound caves. Since 2002 evidences of such lifestyle have been found: lithic tools, fireplaces, rests of extinct animals from the Pleistocene, as well as other 3 human skeletons named: Woman of Naharon, Woman of Las Palmas and Man of El Templo, with ages that vary between 10,000 and 14,000 years old. Placing of these 4 skeletons is evidence of the funerary use given to caves, since the arrangement of the remains do not correspond to natural positions, but to a Post Mortem ritual assemblage.